← I’m fine, its the tractor that needs help! How can we tell that both LTGal and I are suffering from cabin fever? I asked if I could bring in Cranky’s greasy, grubby old engine block so I could practice measuring it up with my micrometer set I got for Christmas… and she LET me! So, while cleaning up in my workroom to make room for the engine block on my work bench, I found some old slides of mine from forever ago. The first slide I pulled out was THIS! My FIRST truck from the late ’80s! 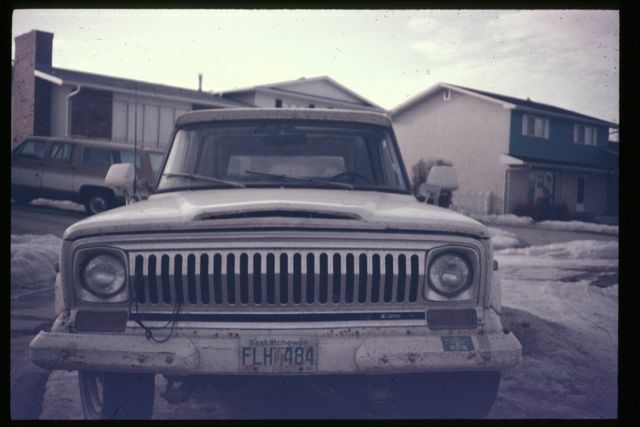 A 1974 Jeep J-10… 4×4, PS, PB, A/C, the whole nine yards! And it also got about 6 miles to the gallon, IIRC.